The Woodcarver is the story of a teenage boy who causes trouble as a way to get attention from his parents. He is forced to make amends and repair the damage he caused. Along the way he meets up with a withdrawn stranger who has come to help him fix what he vandalised. Although only the physical damage is visible to the eyes, the two help each other fix the emptiness inside each of them. The Woodcarver touches on so many relevant issues in today's society: teenagers, separated families, questioning faith in God, and forgiveness. Although approved for viewing by the entire family, I would definitely pre-view it before showing it to younger children, especially if they don't have a lot of exposure to movies. Some of the themes might be a little mature for younger audiences. 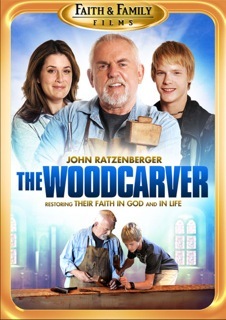 The Woodcarver can be purchased for the amazing price of $10.42 from the Christian Cinema website. Definitely worth looking into if you are searching for a family movie during the Easter Season.